On Friday, April 4, at 7 p.m. Counterpath hosted the opening of Andrea Wolf’s Unsolicited Memories; Archival Exercises. Unsolicited Memories; Archival Exercises is an ongoing research and exploration of methods to physically represent this archive of memories as an embodied experience. I propose an inventory that activates the archive – a re-appropriation of anonymous stories – while recognizing a system in which the function of the past is not determined by its status as unequivocal event, but where its meaning is rather constituted retroactively and rearranged at every point in time. In the functioning of remembering the value of the past is not that of truth but of desire and driven by desire, memory allows for both preservation and erasure. 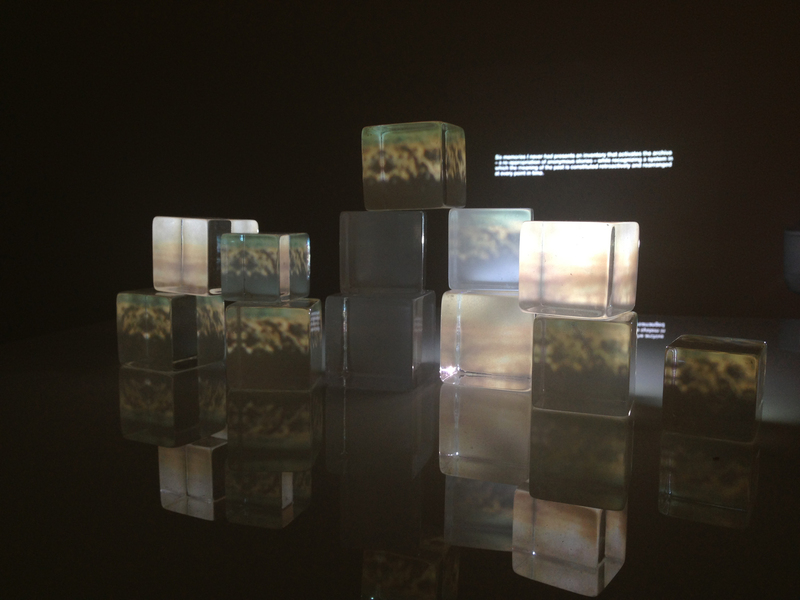 In this video installation new narratives emerge from the juxtaposition and montage of found super8 home movies projected and mapped onto transparent plexi-glass cubes that have been randomly stacked and that seem to contain the images. Each cube, being simultaneously autonomous and part of a larger whole, turns on and off with no discernable pattern, just as memories can be triggered randomly by people, events and happenstance in life. In this way memory and the archive are deconstructed and rearticulated, both preserving and erasing the past, acting as memory objects that can be manipulated to facilitate new versions of the past. Originally from Chile, Andrea Wolf is a Brooklyn based interdisciplinary artist interested in the subjects of time, memory, and image, the devices of remembrance that we produce, and the relationship between high-tech and low-tech. Through video, interactive narrative, video installations, and video-sculptures she tackles these matters, representing the tension between remembering and forgetting. By working with found-footage – with anonymous stories – Wolf leaves a space to be filled by the meaning that each of us brings to the work, through our personal experience. Andrea creates experiences in which memory becomes an action constantly actualized in the present, because only in the present we construct our memory. Wolf has an MFA in Documentary Filmmaking (Universidad Autónoma de Barcelona), an MFA in Digital Arts (Universidad Pompeu Fabra), and a MPA in Interactive Telecommunications (New York University). She was a resident of the AIM Program at the Bronx Museum on 2013 and has shown her work in different venues such as Media Lab Madrid; Fundacion Telefónica, Video and New Media Art Biennale 2009 and 2012 Contemporary Art Museum, Museum of Memory and Human Rights, Galería AFA, House of Government Cultural Center, Santiago, Chile; Scholes 319, White Box Gallery, Yashar Gallery, Local Projects, One by One Gallery, Governors Island Art Fair, The Paley Center for Media, Wave Hill (Bronx Museum Biennale), New York; MIT Media Lab; Central Utah Arts Center; Tou-Scene, Stavanger, Norway; VIZZI Festival, Kiev, Ukraine. Andrea is also founder and director of REVERSE, a multidisciplinary workspace and art gallery in Brooklyn, with an emphasis on new and experimental forms of expression.